This is a fantastic place to take a holiday (click picture to enlarge). I wrote an article in praise of the city after our visit in August 2007 which follows the slideshow below. Selecting a holiday on a workaday family budget starts with a set of criteria, and currently for us that includes warm sun, clean seas, good food, and an accessible range of cultural activities, since we can only take so much lying in the sun, and getting to know about other nations, even through a two week keyhole, is all part of the attraction. Last year on the Amalfi Coast was going to take some beating, but Dubrovnik has been an enchanting follow up. My husband and I booked for fourteen nights half board at the small and friendly Hotel Komodor in Lapad, several kilometres from the old town, but only ten minutes bus-ride, cheap, regular and reliably punctual every 20 minutes from early morning to 2am daily. The tourist population was a good mix of Europeans across the board. We chose not to hire a car or take any of the package holiday trips on offer (these included coach and boat trips along the coast to the Elafiti Islands and to Montenegro, Bosnia and Herzegovina) but instead, armed with the superb little Bradt guide, to explore the rich variety of sights on offer. Days were usually divided between these and a swim in the stunning, glassy blue-green Adriatic, and the extremely clean hotel pool where, charmingly, sparrows and martins came to sip. A walk through the woods of the Lapad peninsula, encountering a few solitary die-hard holiday joggers, led to a stunning view over the port area of Gruz, and a path around the small adjoining area of Babin Kuk led round to Lapad quay, and then to Gruz, with its fish market, huge liners moored and disgorging passengers onto coaches, and local boats keen to encourage tourists to book trips to the islands. The old town of Dubrovnik is utterly charming, and in its small area holds an amazingly rich variety of experience for lovers, as we are, of art, history, and local culture – having been to Prague several years back, which we loved, we felt Dubrovnik was like a little miniature Prague by the Sea in some ways, but of course with its own unique character. It took several hard-working years to restore it to its former glory after the devastating ‘Homeland War’ of 1991/92, and if you look very closely the extensive restoration of stonework can be seen, but you might never know that 70% of houses in the City received a direct hit. We started our exploration with a stunning walk around the outer walls, just under 2 kms round. We took almost two hours as there were so many places to stop, look, and take photographs. Enterprising locals have little stalls outside their houses – we bought a Christmas tree decoration made entirely of pasta and gold paint – and as well as vistas of all the grand architecture within the walls we also saw families hanging out washing, and watering their tiny gardens amongst the narrow streets. 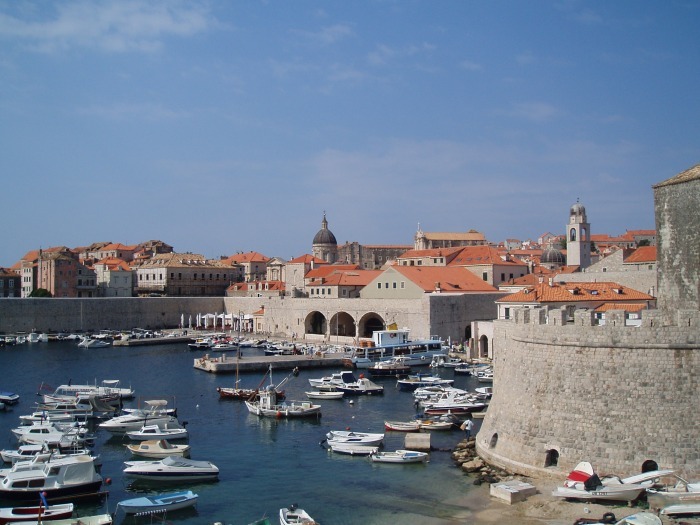 The prices for museums and galleries are all very reasonable, and a ticket for the Maritime Museum, illustrating Dubrovnik’s heritage as a maritime republic, also gives entrance to the Rector’s Palace, Home of Marin Drzic, Croatia’s celebrated 16th century playwright, and the Ethnographic museum. The latter formerly housed grain stores for the City, and it gives a fascinating back-story for those who cannot tour more of Croatia, with excellent, colourful displays of costume, farming practices, local history etc. There are over 30 churches in Dubrovnik, but we enjoyed visiting the Franciscan and Dominican Monasteries, at opposite ends of the marble-paved main street, Stradun, the Jesuit Church, the Church of St Blaise (patron saint of Dubrovnik) with its superb modern-art stained glass-windows by Ivo Dulčić, and the Serbian Orthodox Church, which was quite different, in its decoration, from the others, where we saw pilgrims kissing and pressing their foreheads to icons. Dubrovnik’s Synagogue, small and sweetly simple with its blue starred ceiling and tiny adjoining museum, remained open all through the Second World War, although after the City’s fall to Germany in 1941, restrictions were imposed on its Jewish citizens. We met a retired couple from Essex here, and discovered that we had all lived in Hackney - small world! We went on that morning, poignantly, to the extraordinary War Photo Limited gallery, where the current exhibition was Israel/Lebanon, deeply affecting and almost too powerful for words. Going quite literally from the dark to the light, we collected ourselves and refreshed our spirits with an espresso in the Festival Café on Stradun before going on. For café lovers, young and old, Dubrovnik spoils for choice. We particularly enjoyed the courteous, quiet delights of Dolce Vita, where my husband, a bit of a connoisseur, highly rated the home-made ice cream. Having visited the Dulčić/Masle/Pulitika Gallery and seen for the first time the work of some of Croatia’s most famous artists, we set off to see as much as we could of Vlaho Bukovac, the founder of Croatian modern painting, starting with the Museum of Modern Art, some twenty minutes walk. The building itself is stupendous enough (you soon run out of superlatives when writing about Dubrovnik!) but the art, beautifully laid out in high-ceilinged, sunlit white rooms, is truly worth travelling for. The sculpture terrace includes a particularly vivid armed bronze fish by Vanja Radauš. We saw more of Vlaho Bukovac’s beautifully expressed portraits here, and went on to travel by bus (18kms south) to his birthplace Cavtat, where his former home is now a museum. Cavtat is a former sleepy fishing village (and before that the Greek/Roman settlement of Epidauram) in a beautiful little bay, with a very attractive quay, cafes etc, and usually several large luxury yachts moored (we chuckled at “Ma Biche”!). Swimming off the rocks here got our Best Swim Ever vote (in warm waters anyway – nothing beats Wales for beauty! ), and we were wowed by the Račić Mausoleum here, work of Croatia’s most famous sculptor, Ivan Meštrović. As half-boarders, we didn’t have room for eating lunch out, but found it cheap and easy to buy fresh rolls, cheese, ham, tomatoes and fruit every day from the local supermarket chain, alternating with tasty ‘burek’ pastries from the Niko bakery opposite the Serbian Church – filo pastry, spinach and cheese. It was clear from the hordes of happy eaters tucking into seafood, pizzas, salads etc in the numerous restaurants and cafes in Dubrovnik’s old town that the food on offer, local, fresh and very reasonable, was extremely good. It’s impossible to fit in all that Dubrovnik has to offer, but at this time of the year we were treated to Libertas 58, the 58th Dubrovnik Summer Festival, and dipped into two unforgettable evenings – the Lindo Folklore Ensemble performing on the Revelin Fort Terrace, and a performance by the Festival Drama Ensemble of Aeschylus’ Oresteia, in Croatian, but gripping nonetheless, at the foot of the imposing Minceta Fort. Both of these were in the open air, and we couldn’t miss the opportunity, as inhabitants of the Frozen North, of catching an open-air showing of Harry Potter and the Order of the Phoenix, plus, another night, Die Hard 4.0, with Croatian sub-titles, in the quaint Slobodan Cinema, both in the centre of town and amazingly good value at £2 a pop!